** Anytime anyone writes about Moebius is a good thing. At Right Ear Left, Martin Dupuis writes about Le Garage Hermétique. Part self dare and highly self-confident, he continued writing the story in this spirit – putting himself in a corner and seeing how he could juggle all the open endings he was setting up. Like a jazz musician improvising on stage, pushing ahead, going off key for stretches of time only to come back to the main riff. Some melodic build ups work, others are dead ends. 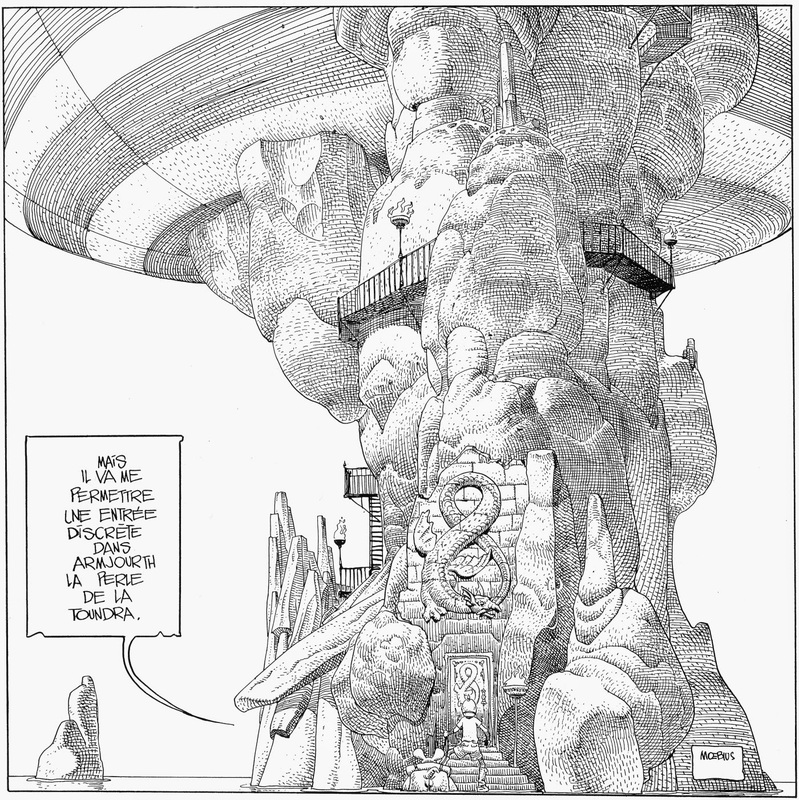 This also allowed Moebius to work through all of his favorite childhood adventure stories, projecting a love of the genre while fully embracing its clichés. The writing and narrative of Le Garage Hermétique doesn’t always work, some parts are weak but the fluidity and ambition of the blast more than make up for it. I've actually spend a lot of time lately looking through my old edition of The Airtight Garage and have even bought the Portuguese Kindle edition of it just to look at the artwork but I haven't read this book in quite a while. I think I need to return to it one of these days. ** I-D talks to Daniel Clowes about Eightball and all of the fantastic work that he's done. "We came out of an era that was just moribund in comics." Clowes says over the phone from his home in California. "The original guys who'd revitalised Marvel in the 60s had faded, and they were replaced by guys imitating them, who were then replaced by guys imitating them, it was this fourth generation of boring, awful comics. At the same time all the head shops, all the drug paraphernalia shops were being closed down - and they were where underground comics by the likes of Robert Crumb would be sold, so that was disappearing as well. There was nothing, it felt dead. But there was a whole generation of us who'd grown up on Mad magazine and National Lampoon and the comedy of Monty Python and Richard Pryor, and we wanted to do good comics. All of a sudden these people started to appear all over the country, trying to do something different, it was a miracle that we got an audience. We were a very, very small offshoot of the comics industry - it didn't feel like we were taking over anything…"
** Dan Elkin at Comics Bulletin had a fascinating exchange with writer-about-comics Colin Smith that dove into their views about comics criticism. I see nothing wrong with the role of critic as being – in your own words – a “cartographer of culture”, lauding the good, focusing on the positive and trying to step away from the often-poisonous air of much of 21st century debate. But that approach simply wouldn’t engage with the culture in the way that I’ve tried to touch upon above. The choice isn’t, I’d contend, between positivity and negativity, between ego and altruism, brutality and kindness. There’s a broad range of critical tools, most of which can be brought into play at different times in different ways in order to achieve particular ends. I’ve written reviews which, for a variety of reasons, have focused on the brighter side of things. I’ve also done the exact opposite. But in the end, reviewing is – to me – about communicating a clear sense of the reviewer’s agenda. ** I'm not a huge fan of Mark Waid's writing (a lot of it is just not for me) but I find the man fascinating. CBR had an interview with him where he discussed the comic shop he owns part of and his digital comics venture. Waid is one of the few comic book writer who is willing to take chances on the business of comics. And he lets everyone know what has worked and what hasn't for him. He's very open that way and I really respect him for that. Tuesday’s edition carries the following editor’s note: “Correction: Because of a production error, Monday’s Sun-Times did not include the correct comic strips and puzzles for Feb. 2. Those comics and puzzles are in today’s paper on Pages 24-26. The comics for Tuesday on are Pages 28-30. Sun-Times editors are meeting Tuesday to figure out a fool-proof system to prevent a fourth occurrence. ** Comics about Harvey Pekar are always good comics. 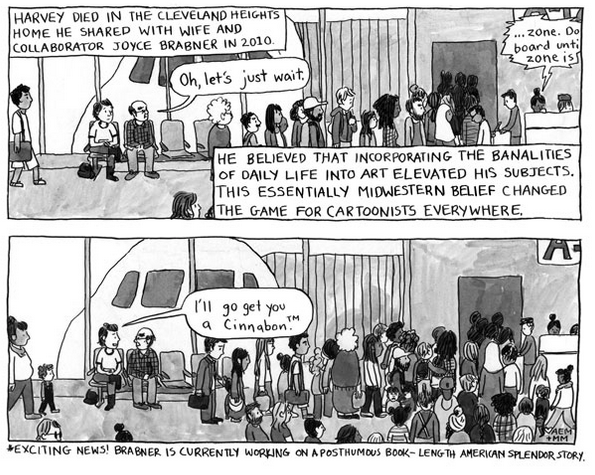 Especially when it's drawn by Melissa Mendes. ** With the upcoming release of The Sculptor, it looks like it's Scott McCloud week around the internet. Here's just a small sampling of what McCloud's been up to. At Newsarama, Forest Helve talks to the man himself about The Sculptor. Rob M. looked at 2D Cloud's publishing plans for 2015. Rob M. reviewed Terrible Movie Nights #1. A number of Paneleers contributed to a quick hits column, covering Beauty, On Loving Women, Comets Comets, The Collected Counter Attack! and Fearful Hunter. We welcomed new Paneleer Amelia Packard and then she reviewed A Bintel Brief. Panel Patter was a part of First Second's Olympians: Ares blog tour. Scott reviewed Matt Fraction and Howard Chaykin's Satellite Sam Volume 2. James reviewed Valiant' Imperium, Dynamite's Jungle Jim and Image's The Nameless. Whit Taylor interviewed Noah Van Sciver. At Newsarama, Scott reviewed Nameless #1. 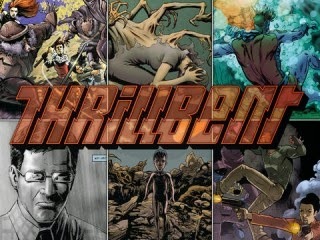 New Comic Book Day means new 140 character reviews by James at Comics Bulletin. Whit has two comics up at Darling Sleeper, What Ifs and Stethoscope Microphone.